Traditionally, jig fishing (or just plain 'jigging'), is a method used when fishing from an anchored or drifting boat with artificial lures. As a vertical, up-and-down, style of angling it will catch fish wherever they are in the water, from just off the seabed to midwater and above. For successful jig fishing, the clue is in the name - a 'jig' being a lively dance. This is exactly what the jig lure has to do if it's going to catch any fish. If you leave it dangling motionless on the end of your line, it will be ignored completely. It's down to the angler to get the lure to perform its lively dance by jerking the rod tip up smartly, then quickly lowering it allowing the line to go slack. The effect on the jig lure far below is that it will flash and vibrate on the upstroke and will flutter back down again when the line goes slack, imitating a wounded or dying baitfish. The lure will usually get hit as it drops down, so the angler will find out about it on the next upward jerk of the rod. Hang on! Productive marks for jigging include seamounts, pinnacle rocks, reefs and offshore wrecks. Jig lures (or 'jigs') for fishing deep are made of solid steel and tend to be long and slender to aid their rapid descent to the depths. The one shown below is a good example of a jig lure of this type. Note the single hook attached to the jig by a short length of Kevlar or Dyneema braid. This is known as an 'Assist Hook', a fairly recent development which has been found to greatly increase your chance of a hook up. And by the way, if as you're dropping your lure down to the depths it stops descending and your line goes slack - Strike! You've got him! Otherwise, let the jig drop to the seabed and commence jigging as described previously. No takers? Then wind in a few turns every so often, working the whole water column until you find the depth at which the fish are feeding. An alternative approach is to quickly wind in the jig back up to the surface, rather like vertical spinning. This doesn't give the fish any time to inspect the lure, and he just may throw caution to the wind and go for it before his chance is lost. These lures won't descend as quickly as the deep drop lures and are therefore more suitable for jigging in shallower waters. American anglers will be very familiar with the original bucktail jigs, made with hair from the tail of a buck (male deer) – and traditional bucktail lures still have many devotees. Modern versions use synthetic fibres and often sport soft plastic ‘jellyworm’ tails. Soft plastic lures suitable for use as part of a verical jigging rig - shads and squid lures for example - are unweighted, so must be used with a lead sinker or metal jig lure attached to the end of the rig. Up to three lures are used on short droppers. This is a killer rig for fishing the wrecks that are to be found off the coast of the UK - an immensely sad legacy of World War 2. If you replace the metal lure with a lead sinker you're less likely to get hung up in the structure of the wreck. Expect a hooked fish to immediately dive back into the safety of the wreck - don't let him! When fishing on the drift, many anglers favour a flying-collar rig used with an unweighted soft plastic lure such as the sandeel shown here. With a sinker rather than a jig lure at the lowest point there is much less chance of snagging on the seabed or the wreck. The technique is different too. Lower the weight until you feel it touch, then reel up slowly about twenty turns or so. No takers? Then stop, drop it down again and repeat the process. When you get a take, don’t strike, just carry on winding. The fish, if it had just grabbed the tail of the lure, will take another gulp – and you’ve got him! So what the heck’s a cephalopod? Relax, it’s just a fancy name for that group of strange creatures like squid, cuttlefish and octopus, or as they’re called in most Latin languages – calamari, sepia and pulpo. These characters all share at least two attributes – tentacles and ink, both of which they’ll use to the disadvantage of those who catch them. When caught, they’re best left in a keepnet over the side for a while where they can discharge their tanks at will. Even so, a well-aimed jet will get you sooner or later - so leave the nice white sweater your auntie gave you for your birthday at home. Squid eat small fish and shrimp, and hunt for these around seaweed and kelp mainly during the hours of darkness. Somewhat perversely, they prefer some light amongst their darkness. But they seem to be completely put off feeding if there’s anything more than a gentle breeze ruffling the surface. So choose a calm night for squid jigging, find a weedy bottom close to a well-lit jetty and you’re likely to be squids in. 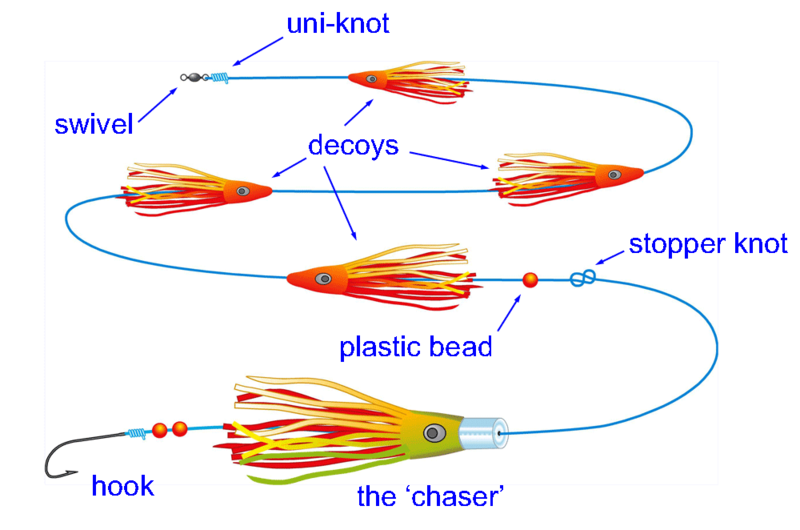 Squid jigs are almost exclusively imitation shrimps and are produced in a variety of colours. I’ve had best success with a pink squid lure, which may lead you to conclude that squid prefer their shrimp cooked. Luminous squid jigs are worth a try too. Some have weighted 'keels' which allows them to sink slowly when used with a casting outfit. 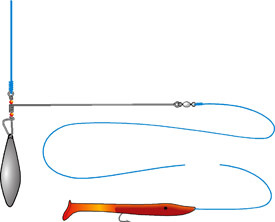 Others are unweighted and are best used with the combined cuttlefish/octopus rig as shown here. Fish the jig close to the weedy bottom and giving it an occasional twitch of the rod tip as you slowly retrieve it. Don’t expect a reel-screaming run and an arm-wrenching fight. A hooked squid feels like a marginally energetic paper bag. Treat it like one, and continue to reel in gently or it’ll fall off. Don’t try to lift it out of the water, expecting it to hang on gamely to the jig - it won't. 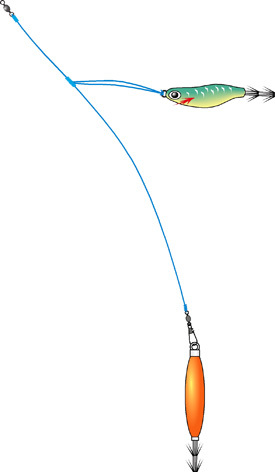 Sink your landing net under the surface and draw your squid into it before lifting inboard. Squid are easy to prepare and cook and are quite delicious. They also make fine bait, either whole for larger fish or cut in strips for smaller ones. Jig fishing for cuttlefish and octopus can be a combined affair, as octopi (that's more than one octopus...) skulk around on the seabed and cuttlefish conveniently operate a few inches above. Octopus lures are a weighted grapnel-like affair. Cuttlefish lures are the non-keeled versions of squid lures which neither sink nor float. They have neutral buoyancy (or the same specific gravity as seawater). Next:~ Don't miss these Jig Fishing Tips!